The Beatles 50 Years Ago Today: June 14, 1967. Beatles Radio: The Beatles, Solos, Covers, Birthdays, News The Fab 4 and More! On May 18, 967 a contract was signed committing The Beatles to represent the BBC and Britain in a worldwide satellite broadcast on Sunday, June 25th. 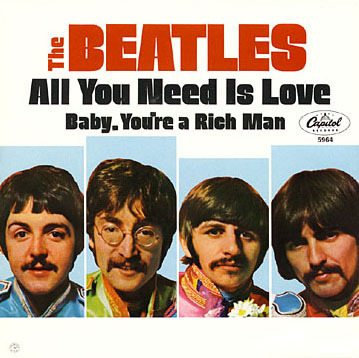 They were to be shown performing an especially-written song: All you Need Is Love. Unable to book space at EMI Studios at short notice, the group assembled at Olympic Sound Studios in Barnes, London, on this day to record the rhythm track. They mostly used unfamiliar instruments: John Lennon played harpsichord; Paul McCartney used a double bass; George Harrison played a violin; and Ringo Starr was on drums. The Beatles recorded 33 takes, but felt that take 10 was the best. A reduction mix was then made, with all instruments copied onto track one of a new four-track tape.